Pain is linked to our mental health and overall well-being. This is where mindfulness comes in. Chronic pain comes in many forms such as migraines, back aches, shoulder pain, and more. Chronic pain affects more than 100 million Americans and it is estimated that most Americans will suffer from chronic pain at some point in their life. Many Americans also suffer from chronic stress. The relationship between chronic pain and chronic stress is clear: the more stressed a person is, the more pain they feel. This means chronic stress can often lead to chronic pain. The inverse is also true, creating a catch-22 and leaving people stressed and in pain, without hope. Due to perceived limitations by pain, many people resign to permanently using painkillers and avoiding previously enjoyable activities. However, chronic pain recovery is possible, in which individuals experience freedom from the limitations by their pain and begin not just surviving, but thriving. We approach chronic pain recovery without the use of painkillers and with holistic, research-supported approaches. We take a unique approach to chronic pain by using a comprehensive approach, which means seeing the problems in the body through a mind, body, spirit lens. Through this lens, we see that emotions drive pain: negative emotions increase pain while positive emotions decrease pain. This means one of the keys to chronic pain recovery is to experience more positive emotions. Creating and experiencing more positive emotions can happen in a variety of ways such as spending more time participating in enjoyable activities, connecting more frequently with supportive and healthy friends, and finding joy in the small things in life. Overall, these approaches and others can widely be termed “self-care”, which refers to the concept of taking care of yourself. Self-care also includes practicing mindfulness, which is proven to be one of the ways to experience more positive emotions and therefore decrease pain. Mindfulness enables you to focus solely on one thing at a time. Removing distractions and placing all of the mind and energy’s focus on one task at a time brings a sense of peace, calm, and enjoyment to what you’re doing. This type of fully immersive experience brings positive emotions by having the entirety of the mind focused on a singular, positive experience. Mindfulness decreases levels of stress, anxiety, and depression. As previously discussed, emotions have a direct relationship with pain: more positive emotions indicate less pain. This means mindfulness is key to chronic pain recovery by decreasing negative emotions and therefore decreasing pain. Mindfulness comes in a variety of forms. You can experience mindfulness while eating, walking, reading, or meditating, for example. Mindfulness is the act of fully experiencing the present moment. This is a game-changer for our fast-paced, multi-tasking culture. We place high value on an excess of productivity and provide little to no space for being present and focused. This means practicing mindfulness might feel uncomfortable at first, but the benefits and the increase in positive emotions are incredibly worthwhile. Like any other behavior, benefits from mindfulness are found in practicing consistently over time. A regular practice of mindfulness leads to lasting benefits. It is a practice that must be cultivated and developed for each person, leading to a rich experience of feeling fully present. It is important to be patient with yourself and take your time in practicing mindfulness. Stay patient and consistent with it even if you don’t see immediate benefits. Also remember to give yourself some slack if you find yourself distracted during some of the first mindfulness sessions. This is very normal when first trying mindfulness and becomes more natural and smooth as you practice over time. If you’ve never tried mindfulness before, try this guided mindfulness meditation. This is a brief video in which you can experience a guided mindfulness meditation and feel the fullness of focused meditation. 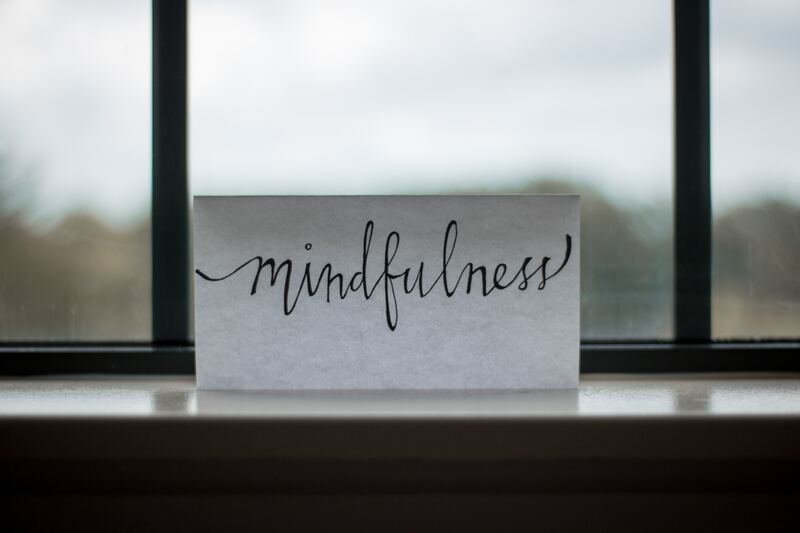 Mindfulness provides an outlet for the mind to unwind, relax, and disconnect from stressors. Easing of the mind enables the increase of positive emotions and a release of negative emotions from the mind. Mindfulness serves as a healing tool for chronic pain sufferers by providing a unique, calm space to experience the fullness of life and decrease stress, anxiety, and depression.